You can have the greatest layout in the world, but if your gravers are not prepared and sharpened properly, then failure is imminent. Inexperienced hand engravers no longer have to sharpen their tools by hand across a whetstone, getting unpredictable results. The solution to graver sharpening is the GRS Dual Angle Sharpening System. This system takes all the guesswork and unpredictability out of graver sharpening and guarantees perfectly sharpened gravers each and every time. I have been using this system in my daily work for many years, and although I'm proficient in hand sharpening, I cannot come close to the precision and accuracy that this system provides. Anatomy - A sharpened graver consists of a face and heel. For most of my work I use a 45º face angle on my gravers, and a 15º heel. The heel of a graver is what the tool rides on during cutting, and allows changes in the angle of the wrist to make the cut go deeper or shallower. Without a heel, a graver would simply dive into the metal without going forward, resulting in a short, deep furrow with a large burr protruding from the surface. This is obviously not what we want for design work, but is definitely what a stonesetter wants as the raised burr is formed into a bead which locks a gemstone into place. The stonesetter and ornamental engraver have different graver requirements, and the setter rarely heels his or her gravers. Sharpening - If you're starting with a graver blank or a tool that's not been previously sharpened, remove the bulk of the material with the 260-grit lap, and gradually work your way to finishing the job on the ceramic lap. After that, resharpening is quickly accomplished with 600 or 1200 grit diamond lap for the face, and the ceramic lap for the heel. Avoid sharpening heels on the diamond laps as they are too aggressive and remove too much material, resulting in a heel that's way too large (if you do use a diamond wheel, turn off the motor and sweep the tool across the lap by hand to limit removal rate). I recommend using ceramic only for your heels, and strive for a heel length of around 1/4mm. This might sound extremely small (and it is! ), but short heels produce smooth cuts with minimal heel drag. If you don't know what heel drag is, imagine a large ship making a turn in a river that's too tight for the long ship. As the ship enters the turn, the stern starts dragging along the outside bank. If the graver's heel is too long, it will produce drag marks in the work as you make tight turns. The tighter the turn or the deeper the cut, the more drag you can expect to see. Keep heels short! Resharpening - Expect to sharpen the face and the heel each time you resharpen. Occasionally you can sharpen the face and still have enough heel remaining, but more times than not you will reduce the length of the heel as you sharpen the face, leaving a heel that's too short. Painting the face and heel with permanent marker before resharpening helps add visual contrast so you can easily differentiate between the old and newly ground surfaces. Note: If a beginner student is having problems controlling a graver I will sometimes increase the heel size a little. Once he or she develops control, I will encourage them to sharpen back to a very short (approximately 1/4mm) heel. Sharpening Angles - Ask twenty engravers what angles they use when sharpening their tools and you'll likely get twenty different answers. The angles used in various gravers are very much personal preference. What works perfectly for one engraver might be uncomfortable and awkward for another. It should be remembered that there are no right or wrong angles, only different ones. A good place to start is a 45º face with 15º heel. This is a successful combination that all of my beginner students complete their engraving course with. I also encourage experimentation with different face and heel angles. Increasing the face angle a few degrees will strengthen the point on any tool, but will result in a change of feel and tool behavior. Sometimes it's just the change you're looking for. Other times it's just the opposite. Only with time, practice, and experimentation will you eventually settle into tool geometry that produces the results you're seeking. 120º Graver - For 99% of my work which requires a V-shaped cut, I use a 120º graver. I was trained with a square (90º) graver and used that for many years. I first saw the 120º graver in 1983 at the Knifemakers Guild Show in Kansas City. It was being used at the GRS table. I tried the graver, but wasn't very comfortable with its wide V. When I began teaching engraving classes for GRS in 1999, Don Glaser gave me a 120º tool and suggested I try it. At first I disliked it, as its behavior was not what I was used to. To make a long story short, I persevered with the 120 and it eventually became my most-used graver. Some engravers report that 110º or variation of the 120º graver is more to their liking. Try different ones from 100º to 120º and see how you like them. PROS: Extremely strong and sturdy point that resists breaking. Adds character to cuts that's more difficult to achieve with square gravers. Excellent for lettering, fine shading, and a variety of other tasks. CONS: Difficult or impossible to shape and resharpen perfectly without a sharpening system. Requires a bit of practice, especially if you're used to using a square graver, as it only requires a degree or two of tilt for wide, bright cuts. NOTE: Many students achieve better results with the 120 tapered to a small face, as a large face appears (and is) less pointed than a square graver. The tapering does not affect the tool's performance, but a smaller face makes it easier for less experienced engravers to follow layouts with more accuracy. Download the 120º Graver sharpening instructions. 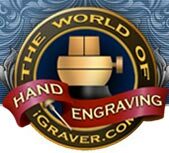 Square Graver - The graver of choice for many engravers worldwide. Incises a narrower V-shaped cut than the 120, and is an effective graver for a variety of tasks. About the only time I use a square is for background removal and inside ring engraving. This doesn't imply that it's a bad tool in any way. While its point is more prone to breaking than the 120, it's still a great tool in the hands of a skilled engraver. PROS: Easier to sharpen than the 120º graver, especially by hand. Its narrow V-cut is excellent for background removal as it's less prone to damaging scrollwork as the background gets deeper. Good all-purpose tool for outlining, borders, shading, bulino, etc. Superior to the 120 for inside ring engraving as the 120's wider V-cut can be difficult to handle in the small space with high side walls. CONS: Less sturdy point than a 120. Must be rolled to a greater degree to achieve wide cuts. Download the Square Graver sharpening instructions. Flat Gravers - The flat graver is my tool of choice for script lettering or brightcutting. When sharpened with a short radius heel, the flat graver can produce dazzling results with minimal or no heel drag. I prefer a face angle of 40º and a 15º-20º heel radius for lettering. Flats are also good for block lettering, wriggling and leveling backgrounds in relief engraving. Like all of my gravers, I keep flat graver heels very short as well. To radius the heel, leave the toolpost angle loose on the Dual Angle fixture and rock it carefully on the ceramic lap between 15 and 20º. Download the Flat Graver sharpening instructions. Round Gravers - Good for bead raising and certain block lettering tasks. Carefully sharpen with a short 15º heel that follows the curvature of the graver. For bead raising, round gravers are rarely heeled. Liners - A graver that incises a series of parallel lines in one pass, liners are available in a variety of sizes from very narrow to super-wide. Liners are useful for block lettering, Florentine finishes, and especially western engraving. CARBIDE is an excellent graver material, especially for jewelry engraving. Its superior hardness and ability to take (and keep) a high polish make it an ideal material for brightcutting precious metals. Carbide resists microscopic particles of gold or other metals adhering to its heel surfaces better than steel gravers. These small particles will degrade the brightness of cuts, but can easily be removed by pulling the heel across a small piece of leather treated with 50,000 mesh diamond spray. Note: When the leather becomes dirty and worn, replace it with a fresh piece. You'll be surprised how bright your gravers will become with a fresh piece of clean leather. Also, tooling leather is the best choice for graver polishing. Dyed or oil treated leathers will not work as well as untreated leather. PROS: Stays sharp longer and can produce extremely bright cuts. CONS: Can only be sharpened on diamond and ceramic, and it's super hardness results in a brittle graver that can break easily. Only available in square blanks or cylindrical round, so it must be ground into other shapes, such as flats, rounds, etc. Printing of tutorials for personal use is permitted.